Those new Windows 10 apps have permission to run in the background so they can update their live tiles, fetch new data, and receive notifications. Even if you never even touch them, they may drain some battery power. But you can control which apps are allowed to run in the background. Even if you do use universal apps, you don’t necessarily want them running in the background. For example, by default, apps like the “Get Office” app–which only exists to bug you about purchasing Microsoft Office–have permission to run in the background. Apps have have permission to run in the background will show up on the battery usage screen, which estimates how much power each one uses on your system. But you don’t need to wait for them to start draining battery power–if you don’t use them, you might as well disable them right now. 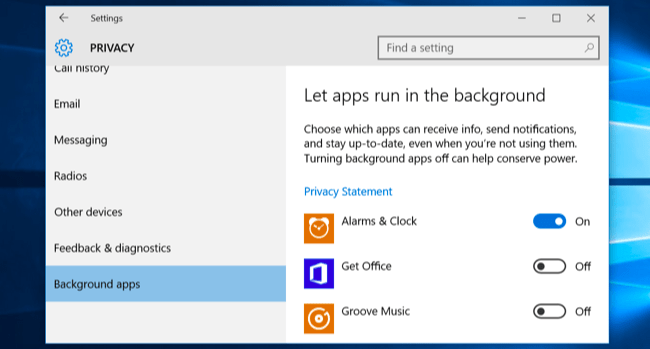 To see which apps have permission to run in the background, open the Start menu or Start screen and select “Settings.” Click or tap the “Privacy” icon in the Settings window. Bear in mind that there’s a downside to this. If you prevent the Alarms app from running in the background, for example, any alarms you set won’t go off. If you prevent the Mail app from running in the background, it won’t notify you of new emails. Apps normally run in the background to update their live tiles, download new data, and receive notifications. If you want an app to continue performing these functions, you should allow it to continue running in the background. If you don’t care, feel free to prevent the app from running in the background. You can still use the app normally, but you may have to wait for it to fetch new data after you launch it. You could also use Battery Saver mode to accomplish this. When Battery Saver mode is activated, no apps will run in the background unless you specifically allow them to. This will save battery power. Battery saver mode is activated automatically when your battery falls to 20% by default, but you can also activate it by tapping or clicking the battery icon in your notification area and tapping or clicking the “Battery saver” quick settings tile. This is particularly useful if you’re fine with apps running in the background most of the time, but you want to cut them off to save power when you really need to stretch your battery. You can customize Battery Saver mode from the Settings app, too. Open the Settings app, select “System,” select the “Battery saver” category, and click or tap the “Battery saver settings” link. Apps won’t be allowed to run in the background while Battery Saver mode is enabled unless manually add them to the “Always allowed” list here. None of these settings control traditional Windows desktop apps, unfortunately. They only apply to Windows 10’s new mobile-style universal apps–originally known as “Metro” apps on Windows 8, which Windows 10 has more control over. That’s why this process is similar to how you’d prevent apps from running in the background on an iPhone or iPad. If you want to prevent desktop apps from running in the background, you’ll have to do it the old-fashioned way: close desktop applications when you aren’t using them. You should also ensure apps aren’t hiding in your notification area and running in the background there. Click or tap the arrow to the left of your system tray to view all system tray icons, then right-click and close any applications you don’t want running in the background. You can use the Startup tab in the Task Manager to prevent these background apps from automatically loading when you sign in, too.